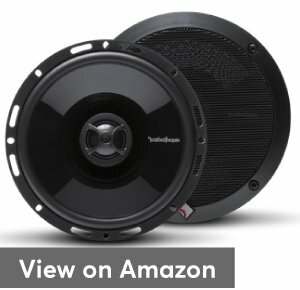 So you want to get best 6.5 speakers for your car? …..and don’t know what to do. 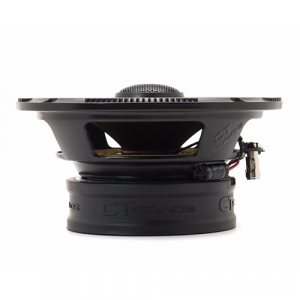 Because Luckily, We have picked top rated 6.5 speakers from all famous brands, Like Rockford Fosgate, Infinity Reference, Pioneer, Kicker, JBL, and many other speakers which you can consider for excellent sound quality. Today in this guide you are going to more confident to get all of the information about car speakers only from one place. First, I will share Top 10 6.5 speakers from top famous brands in this post as well as a buyer’s guide with all the detail. 13 How Do You Install Car Speakers? When it comes to choosing the best 6.5 speakers, there are two things that you should consider. 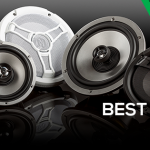 The first thing is the quality of the product, and the second thing is compatibility with both your budget and your vehicle.so, First, we’ve created a Table list of Best top rated 6.5 car speakers after researching online and spending hours in testing these car speakers have enough credibility to make a buying decision. Let’s suppose if you are thinking why the list of products being made because it’s the best solution for the consumer’s who want to take some important information at a quick glance. 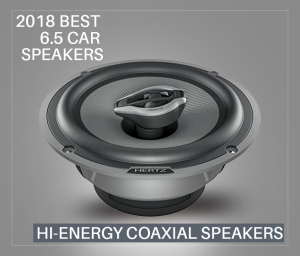 The market is full of competition right now, Many companies are releasing the car speakers, component speakers, and many other related products. For peoples who don’t have enough knowledge of the speakers, they can easily make the buying decisions to read all the details. Now, after the list of top rated products. Let’s dive into the product topic in depth. We will get all the information about the best 6 1 2 speakers that are available in the market. It will help you to understand the high-quality product more in-depth. 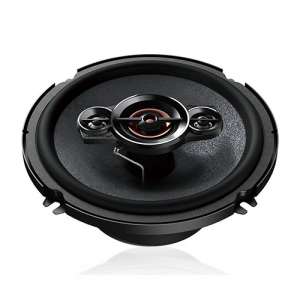 Our first best 6.5 car speakers in this series come from Rockford Fosgate known as P1650 6.5 inch. 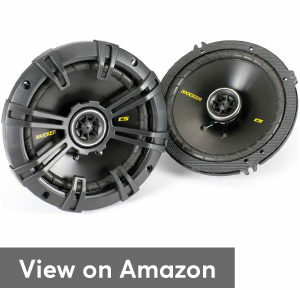 Rockford is top car speakers brand and this series is no doubt the best series and 1650 is the most sold speakers. It is the popular product all the time built by this company and still, it is number one on our list. So, now without any further praise. Let’s dive right into the specs of this speaker. The speaker has a PEI Dome Tweeter. It delivers a nice and smooth sound. Not to forget the speaker covers/grilles are also included to protect from outside damaging problem. Overall frequency response 45 – 20,000 Hz and RMS Power is 110 watts per pair / 55 watts each and Peak Power 220 watts per pair / 110 watts each, and We evaluated its 88dB sensitivity. The Rockford Punch series is favorite in my list and best 6.5 door speakers 2018 out there in the market. And yes they are providing two speakers with great sound, the material quality is also great, 2-way design with more bass, comfortable and high-quality sound. On the other hand, this speaker model is affordable with all of the features. Undoubtedly, this is still the top 1 product on our list. Our second best 6 1/2 speakers come from the Infinity Reference series and pretty much every single product of this company is being held in high esteem and honor among the greatest sound quality and now this product is known as Infinity Reference 6522IX. This speaker model also comes in pair and the 6522IX by Infinity is made for people who prefer an extremely clear and high tweet sound which provides a great feature of rotatable Edge-driven, textile tweeter as compared to other speakers. And it is specially designed to rotate for specific direction to get sound for aiming purpose. You can move the angle directional to get more high frequencies. The tweeter also has a pressable small button on the front of it to boost more clarity of the sound for highs. This is called a “selector switch button” which is a great feature that helps to get the sound up to (0dB to 3dB) treble increase. Plus One polypropylene woofer cone is another amazing feature which has a large surface area. 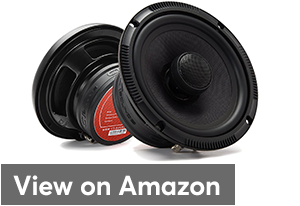 Larger woofer cone gives the more efficiency and better low-frequency output so you get the better bass response and overall better sound quality in your car. The frequency we check of this speakers is 53 Hz to 21 kHz and the speaker sensitivity rating is 93 dB provided by the manufacturer with a 4-ohm power which will use nearly 2 watts of power. Other than that the configuration of these best 6.5 coaxial speakers is very easy because you didn't need any rings to mount them. The Infinity 6.5 speakers have its own mounting brackets with plenty of holes on it to fit the speaker. This model of the speaker also comes with grill covers which helps to protect the speaker cone. 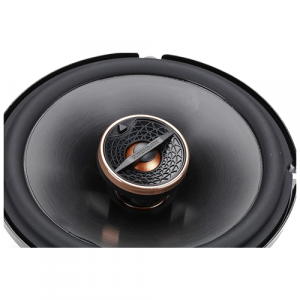 And the material of this speaker is black shiny premium design, In addition, you will also get various installation adapters which are freely available with it which will be used according to the installation process. The price is also affordable. Now let’s come to the downside of the speaker. The speaker loudness is much high. It looks premium but shames it is made of plastic material so, the mounting holes can be a break at the time when you strongly tight the screws in holes. But it doesn’t mean that the sound is not good. If you like the high-frequency tweet sound so it is the best choice for you. Overall, the sound of a speaker is amazing and it offers many features that end up making up for the price. I do recommend using strong amp If you like the more highs with the clarity of sound if you are looking for just more bass so this speaker is not good. You will need a subwoofer to make a strong bass sound. Bio 6.5, with another marvelous model 2-Way silk dome coaxial car speakers from CT Sounds. It has a similar style as Infinity reference 6522IX but it contains steel polypropylene cone basket with hi-roll NBR (Nitrile Butadiene Rubber) surround. Just like 6522IX, this speaker will also provide you an extremely high-quality sound with 4-ohm power impedance. CT Sounds Bio posses all the features from Infinity reference but a few different features which we will discuss below in detail. This model offers 2-way design with a stylish look that is intended to offer the great sound quality. In real terms, this means you can complete the entertainment systems in your vehicle with great sound plays. Interestingly, If you're interested in realistic sound for a low price, so you will be surprised to find this one to fit with your budget. This tweeter can handle higher sound levels and it will convert the power into crystal clear sound by reducing the distortion. The Component Speakers will provide you with this same functionality BUT with more power (subwoofer + tweeter) and they will be separated to give you control of your sound by positioning yourself with extra high expensive cost. But this speaker we analyze the tweeter and subwoofer with the same place can hear really loud with a decent amount of bass. Same like the reference you can not rotate the tweeter on your desired position. If you want to complete your sound system without buying a woofer for bass. and you like loudest 6.5 speakers with tweeter this is the best choice for you. The sound density is 89 dB which is also great for frequency 50Hz – 20kHz. Also, the RMS power per speaker is 30 Watt and 60 Watt Max power handling. The grills are not available..So be careful to screw them by protecting the front cone and tweeter of the speaker Otherwise, these are great and will make rocking your ride. Finally, In CT Sound 6.5 2-way speakers must be your preferred option if you want to get a marvelous experience of decent bass and tweet response with the low budget. Tweeter and Woofer driver provides the high-quality performance with an incredible sound output. The car speakers are really great if you are finding highly satisfied quality and affordability. The fourth one in our list comes from Kicker. 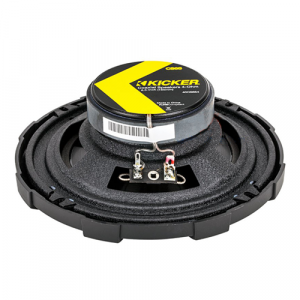 The Kicker yellow CS series is the significant upgrade and most value-driven series ever built by this company and our favorite model in this list is Kicker 40CS654. The reason to choose this model is to cover up all the important aspects without breaking the bank and You'll enjoy your music with great sound quality and bass with low price. Kicker best 6.5 car audio speakers work in the same way as the Infinity reference 6522IX the difference is that it has polypropylene woofer cone with polyester foam surround which produces impressive bass as compared to infinity. 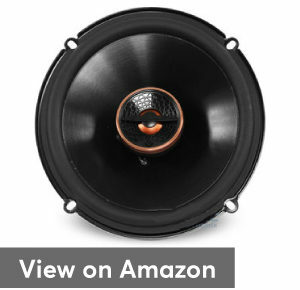 Other than that, This speaker provides steel stamped frame which is a great feature that helps to protect the speaker It handles up to 100 watts RMS and 300 watts peak power per each speaker which is enough for 6 1 2 car speakers as well as the frequency of sound 40 Hz - 20,000 Hz and 90 in decibels which helps you to get more crystal clear volume of sound. I figured out that this speaker has a heavy-duty magnetic structure with EVC (Extended Voice Coil) technology which is designed for super brilliant audio quality. With all the good things this 6.5 kicker speakers also have the mounting depth as shallow as possible for those installations that are limited on space so drastically reduced shallow mounting depth allows perfectly fitment into any vehicle application without any further customization. Now after praising the features I have a few minor gripes of this speaker. it has woofer and tweeter combined all in one speaker but the twitter not provided the rotatable feature it is fixed So if somehow you like the directional sound so there is no choice to get the sound with multiple directions. and also the tweeter performance is not good at a higher level. The steel frame can be the cause of more heat which is not much as effective. 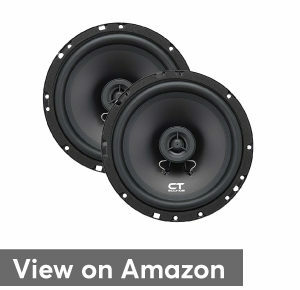 Overall the Kicker door speakers 6.5 are a great choice for those who are on a tight budget. It is beneficial for those who like the more bass sound with tweets. Easy to install with 2 grills, 2 speakers, 8 screws, 2 pos, neg wires and 4 wire crimps no doubt, you are getting what you are paying for. The first great feature is a cap of speakers if you’re having the speakers out in the open, it would be awesome to protect the speaker cone and twitter on the top. 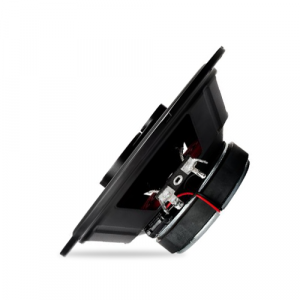 Another amazing thing is the silk dome tweeter which is smoother, warmer and more natural as compared to hard dome tweeter and they have good tolerance to build the sound quality so it is still convenient. Let’s dive into the more details. Meso has Y30 Ferrite Magnet which is one of the strongest ferrite Massive Magnet, Its purpose to maintain the strength of signals for perfect highs and powerful mids to produce high-quality sound. Another great factor is this speaker made of glass fiber cone which actually safe to absorb moisture from the air or changing its mass. 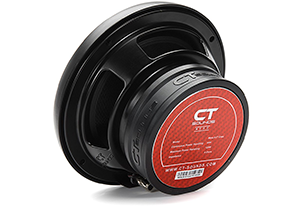 It is the major benefit of cost saving speaker and If you have a problem to place separate tweeters and speakers in your car and want something that speaker should have all these facilities so no worry, the CT Sounds Meso set is a great choice for you. and that’s not all, you will also get a 1-year warranty. We check 120 watts RMS and the impedance power is 4ohm. Sensitivity is not high as compared to others its recorded 88db by a manufacturer. Frequency Response is 45Hz – 10Khz. We won’t be saying that the Meso is the perfect best 6.5 inch car speakers, it also has some imperfections like the massive magnet of the speakers it sometimes called ceramic magnet which feels a bit too overweight of the speaker and Please keep in mind the magnets can take a few spaces in the door and can barely fit in with just about an inch or 1/2 inch more, Be aware at the time of installation and must check by rolled down the window it can hit the back of the speaker magnet. 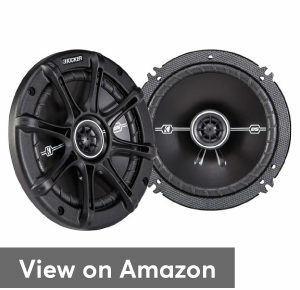 These are good 6.5 car speakers and a little bit pricey and have premium quality as compared to other speakers just for the things that they are providing. Performance considerations, Speaker accessories Wire, all hardware hookups. Definitely, comes everything which you want to build for great sound. Kenwood sports series car speakers are a great replacement for factory speakers and these 2-way speakers enrich music with balanced high type’s midbass and midrange details and they will fit into any car audio budget. Number 4 on our list is KFC-1665S noise canceling speakers which are good for extremely clear sound. This speaker is famous for noise canceling feature it’s steel black basket helps to reduce unwanted noise from the sound and less distortion. The noise usually degrades the performance of any audio component. So, you get quality music reproduction. Kenwood provides 4 speakers. A pair of 6.5 coaxial speakers (2-Way) and a pair of 6X9's (3-Way) with covers. This is a great deal if you are going to upgrade a complete music system in your car. 6.5" fronts and 6X9 rears. Other than that, these speakers have rugged materials that keep them safe from extreme weather conditions however not marine certified so don’t use for marine applications. That’s why it’s an ideal choice for those who want to get extra benefits with a reasonable budget. The design of the Kenwood 6.5 inch speakers looks premium and professional and the bright color appears very beautiful and flashy. The best thing about these speakers is very lightweight and handy. They have 4 ohms with 300 watts of MAX power and 30 watts of RMS power (per pair) capacity for getting the ultimate sound reproduction. 92 dB sensitivity and 35-22K Hz frequency is enough to provide the sound efficiency of the speaker. The polypropylene cone is superior to create mid-range and mid-bass response. 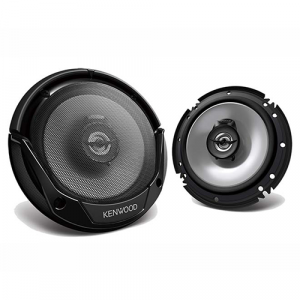 This Kenwood model is also made of steel that increase its durability so you’ll get a long-lasting speaker for your car. 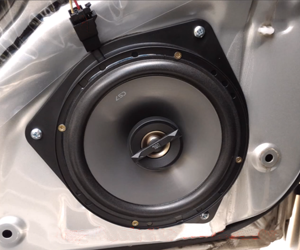 A few limitations we will discuss that have decreased the overall popularity of this speaker Installation is little bit difficult to maintain properly in order to stop crackling the sound and they have a specific driver combo in front of it for controlling the pattern which creates difficulty to fit into the car. This speaker doesn’t provide strong bass. 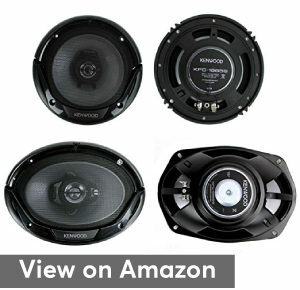 Kenwood is providing fantastic 2 sets of car speakers (2-way and 3-way) in the same price. (one woofer and two tweeters) The price is also amazingly cheap with a lot of other features. It might not be best for the sound as you like to get but it is much better than the other cheap speakers that are available 6.5 midrange speakers in the market. The design is also beautiful and lightweight overall positive rating is enough for listening to great music with sharp and clear sound.For installation no need to add any extra anchors or make another mount. They have enough holes to fix easily in car doors. Kicker yet again, a 41DSC654 model is almost the same as the Kicker CS but it contains the power difference and doesn't provide much power like the 40CS654. Just like the CS654, this model will also provide you with great bass and impressive sound quality. Kicker 41DSC654 possess all the features from the 40CS654. It just provides 60 watts RMS power and 240 watts peak power. And it comes with the strongest steel stamped speaker frame The frame available in this speaker is advanced and sharp enough to provide complete safety of the speaker. It also has the high sensitivity DS motor which provides high volume sound with both choices by using factory head unit or high power amplifier. It also contains balance dome tweeter which is extremely efficient. With all the good things this model also has the larger woofer cone surface area to provide ultra-clean bass sound. 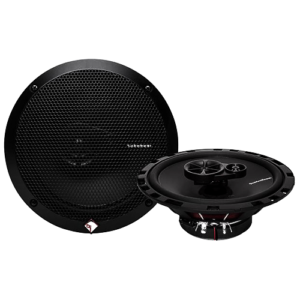 You must know before purchasing this speaker, The balance dome tweeter provides mid-range sound doesn’t provide enough performance at a higher level and the price of this speaker a little bit high as compare to CS654. This kicker model beautifully designed with the strong frame and the upside frame provides more deep shallow design and pressed frame shape so it makes the installation process more easy to place in the door without creating any outside distraction as compared to others. The number 7 speaker is going to be from the famous Hertz audio company. 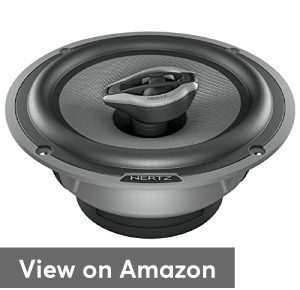 Hertz is a popular company in the audio industry which designed lots of high energy products. HERTZ HI-ENERGY Speakers can create a high power audio system which may generate very high undistorted sound pressure. Hertz six and a half inch speakers is a 2-way speaker which contain a great feature of the rotatable tweeter as like infinity. 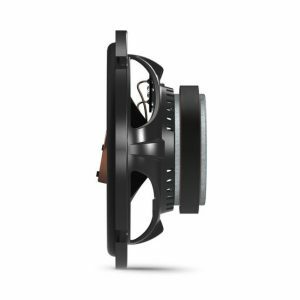 The tweeter is designed to rotate 210 degrees, with stopping points in each direction They can move towards the listening point for high volume sound. Interestingly it has an oversized magnet with pure copper voice coil wound which provides outstanding energy for higher and crystal clear sound from the Damped Mesh Fibre cone. Damped Mesh fiber cone produces more deep bass. This speaker sound sensitivity is 92 dB which is best to make an awesome music sound. They have impedance power 4 ohms with 200 watts peak power and 100 watts RMS power. The only thing I noticed a little big metal plate around the screw holes than other 6.5’s that required some custom work to install in rear doors. The overall sound is good it can handle the higher level volume without any distortion. This speaker has premium look and pretty pricey but has the worth of the price with a lot of features that makes you satisfied with the desired sound output. I would suggest that continuously long exposure to high sound pressure can harm your hearing; Therefore. Try to listen safe sound Other than that they also come in a pair. and they are made by Italy so quality is also reliable, it depends on your choice how much price you are willing to pay for quality speakers. 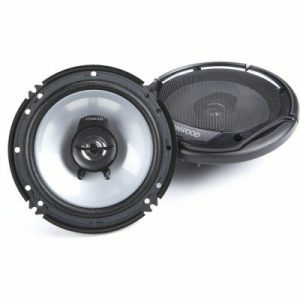 The number 8 is another Rockford Fosgate 6.5 3 way speakers. 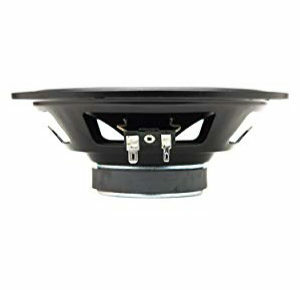 Although this speaker model is from none other than the leader of audio industry Rockford Fosgate, For those who don't know Rockford, This company is providing top-notch quality products of speakers in the market that have become famous over time if you are looking for superior choice so this speaker model will provide you extremely high-quality sound. The product that we are presenting today is Rockford Fosgate R165X3. R165X3 has a superior design which is built with high-quality materials and updated technology it’s polypropylene cone woofer will provide a note to note quick transitions of punchy sound. Basically, it is a 3-way speaker tweeter along with woofer and super tweeter for delivering more crystal clear sound. Super tweeter is enough to provide extra high frequencies in an audio track. It has a fantastic crossover which produces specific frequencies that facilitate the drivers for sharper separation of the sound. So it produces low sound with low-frequency driver and high sound with high-frequency driver separately. The other speaker tweeters are designed with metal and textile (silk) but Rockford Prime contains piezoelectric crystal tweeters. Piezo tweeters normally are just a type of high-frequency speaker they are not like everyday speakers normally speakers have a coil and magnet to build the sound but piezo tweeter produce midrange ultrasonic sound frequencies which is extremely efficient. They don't require power just some alternating voltage makes its quality sound. It’s providing sound sensitivity 91 dB with 52 to 52 kHz frequency range. They also have some limitations. The speaker doesn’t provide an adjustable tweeter to rotate for aiming purpose so you can simply put into that place. Other than that they are unable to produce deep bass so you will need to install subwoofer for getting extra bass. They are not marine speakers so keep safe in cold or wet conditions. The design of Rockford Fosgate 6.5 speakers looks premium overall it is best with all of the great features Grill Cover also included with the final purchase which defense the speaker from any hit. Decent size magnet allows the installation of the speaker easy. There is a super tweeter deliver the premium sound quality with less distortion. Last but not least Pioneer TS-A1676R is finally here. Pioneer TS-A series is the most famous series build by this company and It is the newest and latest version of Pioneer 6.5 speakers which is designed with lots of features. This model offers improved bass and dynamic range with the new style of the design. Pioneer 6 1 2 speakers A1686 model has some serious power of sound with its multilayered mica matrix woofer if you are looking for enhancements of the sound so you can enjoy the music without any distortion. The pretty hefty magnet of this speaker has high-temperature voice coil creates warmer and heat waves and these waves create more clear and efficient notes of sound and the tweeters also have waveguide technology for increased sensitivity in the sound. These are 4- way best speakers for car with 2 small sides (tweeters) add 1 more side (tweeter) to push the sound and plus woofer cone. I have another great review of pioneer best 6x9 speakers with bass you can consider them too for the size of 6x9. These speakers are designed for clear detailed sound quality and can handle up to 350W Per Pair (175 Watts per speaker) peak power. The evaluated sound frequency recorded 32Hz-38kHz and 91 dB of sensitivity. 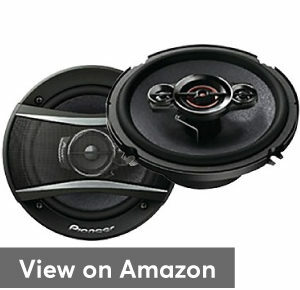 Pioneer A-series car speakers are an excellent choice for your audio upgrade and are available in 6.5-inch size speaker. So now let’s come into the downside the speaker frame only covers the center of the speaker and Larger front side of speaker frame may create difficulty to mounting them perfectly. They can’t provide enough bass and can’t handle “loud” music. These speakers are only designed for car audio so don’t use them for outdoor or marine applications where any chance of water exposure. Hope so now you can find your favorite speakers and after buying the right set of speakers the important thing is to know the correct information, how to install them and more other technical details. Tips and tricks are helpful to make your work easier and you can save your time. Do you have current audio setup detail and your setup is able to work with your selected speakers? So just go ahead and follow a few things which are compulsory to begin the installation. First, need to remove the old speaker and place a new one. Remove your door card so it will be easy to connect the speaker with right wires. Don't connect the speakers directly when current is flowing through in the wiring. Just disconnect your battery first and then start the installation. In this step, you need to adjust your new speakers to install a new harness and connect them correctly. When you have done will all the process so ensure to check the whole audio setup is working fine. This is the most common question buyers asked, There are several car speakers brand in the market. but my personal suggestion goes to Pioneer, Infinity, Rockford Fosgate car speakers these speakers produce very good sound quality with minor disadvantages. I have found lots of excellent customers feedback about these brands. Other brands are also doing great you cannot simply ignore them. so it depends on the features which you want to get from the speaker. What are 2 way or 3-way speakers? 2 Way speakers usually contain two components in the speaker one is woofer and another is a tweeter, the woofer is used to produce low-frequency sound and tweeter produce high tweet sound. these speakers are common and create a balanced high-quality sound. 3 Way car speakers also called tri-axle speakers has one woofer, tweeter, and an additional midrange component. Midrange controls the overall performance and produces a balanced frequency of sound in speaker. This frequency balance makes the sound more natural to the human ear. No, These are not waterproof, If you are looking for marine applications so you will need to search for marine speakers. Will they affect to rolling down the windows? 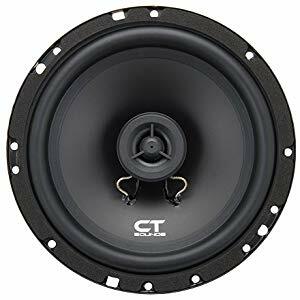 Some speakers like CT Sound Meso has a pretty large magnet, so you will need to check the space in your car door. 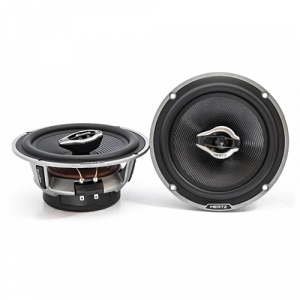 A large magnet is good for a high bass excursion and 80% chance they will fit in the door, But in general, these type of speakers are BANG for the clear and high-quality sound!!!! Choosing the right speaker is difficult, especially when you are going to buy for the first time. 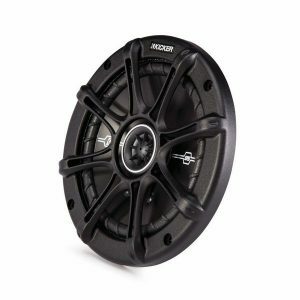 However, we did a lot of effort and research for top rated 6.5 coaxial car speakers to get all of the details to help you make a buying decision and come to a conclusion. Just remember a couple of things before buying a new pair of speakers. If you are using separate amplifier so just pay attention to RMS Power Rating. And if you are buying a branded speaker so just check the warranty information properly. In our top reviews all speakers are listed with the great and different type of qualities so now the choice is up to you which set of speaker is good for you. the price, the design quality and the sound Hopefully the detailed buying guide and our top review will help you to take a good buying decision. You can also read out our other guide best double din head unit for your music system. Many stereo systems have different output nodes and won't connect with certain speaker setups. So, make a decision and enjoy your traveling with amazing sound. 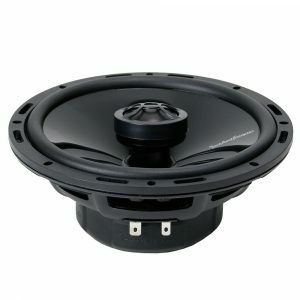 Car Speakers Buying Guide – What Speakers fit my Car?